The Ottawa Citizen has just posted an interesting, retrospective article on Rush titled Truly Canadian: There is nothing more Canadian than Rush. It has been almost 40 years since the trio from the suburbs of Toronto started confounding some listeners and delighting others with complicated musical arrangements and the weirdest lyrics on the airwaves — dystopian fantasies, the stultifying effects of growing up in the suburbs and the philosophy of Ayn Rand. Rush was “always an acquired taste,” said Rolling Stone in 2008, the one and only time the magazine deigned to devote a cover article to one of Canada’s most significant cultural exports. Check out the entire article via this LINK. Top Taste Maker Albums: #4 Billboard has just announced that Rush's Clockwork Angels, after debuting at the #2 spot on the Billboard Top 200 Albums Chart last week, has dropped down to position #10 with approximate sales of 27K units; a drop of 74%. “So, for me,” continues Lee, “I have to try and get into his headspace and I have to try and understand the lyrics from a point of view that’s meaningful to me even if it’s not always the same as the writer’s intent.” You can watch the video below or directly at this LINK. Neil Peart's hour-long interview that originally took place on June 13th with legendary DJ Jim Ladd on Sirius XM's Deep Tracks station is now online. During the interview, Neil discusses not only the creative process behind the making of Clockwork Angels but a deeper look into each individual track. Neil also narrates the prose introductions from each song which, during the original airing of the interview, led to the playing of each song in order. Neil expands on the story line behind each song which gives us some insight on the complete story-line that will be presented in the novel. Neil speaks in his usual eloquent and verbose manner which makes for a very interesting listen. You can listen to the interview below or via this LINK. Thanks to reader RushFanForever for passing along the link. Rush's Sound Engineer Rich Chycki, who recorded Clockwork Angels and mixed Snakes & Arrows as well as other Rush offerings including Moving Pictures 5.1 and the recent Rush Sectors box sets, has updated his blog with his thoughts about recording Rush's new album. It feels like it’s been a time of all things ‘Rush’ over the past while. As you all know by now, we spent most of the late fall and early winter 2011 recording Clockwork Angels at Revolution Studios in Toronto, Canada. I had selected that room for its cavernous but controlled drum room and I was pleased with the recorded results, as was Neil. The clockwork stage kit is one of the best kits I’ve ever had the pleasure of recording. Check out the entire entry via this LINK. Update (06/26/2012): Part two of the interview is now online. Thanks to RushFanForever for the link. MusicRadar has just posted the first of a two-part lengthy interview/discussion with Geddy Lee and Smashing Pumpkin's and Rush fan Billy Corgan. The discussion centers around "...the merits - and challenges - of the album as art form..."
From the article:It's a good time to be Geddy Lee, and it's also a good time to be Billy Corgan. Within a week of each other, both artist's bands, Rush and The Smashing Pumpkins, have released albums (Clockwork Angels and Oceania, respectively), that stand among their finest work. They call themselves “The Edge Walk Angels” and on October 14th, 2012, these six Rush fans from across the globe will meet in Toronto to perform what many are calling a crazy stunt - all in the name of charity. The fans, Mike Sword, Pamela Amos and David McLeod from Scotland, Ray Subject from Canada, Jennifer Ayers from the USA and Tracey Thomson from Australia, will participate in the CN Tower Edge Walk. From the group's site: We are “The Edge Walk Angels” - 6 ‘mad’ ‘crazy’ RUSH fans with a tendency to be a little ‘nuts’ as described above. We are 3 Scots, a Canuck, a Merkin and an Ozzie all making our pilgrimage to Toronto to see RUSH in concert, and also raise funds for the nominated RUSH Eucon 2012 charity; The Downs Syndrome Association. We are doing the CN Tower Edge Walk, at Toronto’s iconic landmark, The CN Tower, 1100ft/356m above the ground. See the video to understand! Few have ventured and most have walked away repeating the quotes above! Today, the rumors have been confirmed from an article at Billboard.Com: With "Clockwork Angels," its first new album in five years, just out, Rush is planning a tour that will surprise many of the Canadian trio's fans. Last week Rolling Stone Magazine posted an interview with Neil Peart discussing the band's latest album, the upcoming tour and other topics. Not known for having much love for Rush, that piece was a bit of a surprise. On the heels of that article comes another interview from Rolling Stone Magazine; this time with Alex Lifeson. Titled Q&A: Rush's Alex Lifeson on 'Clockwork' Tour Setlist, Hall of Fame Prospects, the interview touches upon several topics including the set list for the upcoming Clockwork Angels Tour, the making of the album and the age-old story about Rush's exclusion from the Rock and Roll Hall of Fame. From the article:It's got to be tough to make a setlist when you have so much history to draw from. Back on June 11th, Geddy Lee and Alex Lifeson were the special guests on Jeff Wood's radio show on Q107; Toronto's Classic Rock station. That session is now available online at YouTube and can be viewed below. There are some new details now available on the upcoming 12th Annual North American Rush Fan Convention (RushCon). In addition, registration for this year's convention is now officially open. The three-day convention will take place in Toronto at the Hard Rock Cafe from October 12th through the 14th, 2012. The convention will coincide with the two concert dates from the Clockwork Angels Tour occurring on October 14th / 16th. The guest speaker, appearing on the 13th, will be John Arrowsmith; Rush's pyrotechnician and tour photographer. Other events during the convention include several Rush-related games (Countdown and Jeopardy), a charity auction, a photographic tribute to Andrew MacNaughtan, an Anthem Records office tour and more. For complete information on this year's convention, please visit www.rushcon.org or follow them on Facebook and Twitter. Rolling Stone has justed posted an interview/article with Neil Peart. Titled Neil Peart On Rush's New LP and Being a 'Bleeding Heart Libertarian', the interview discusses the band's latest concept record, their upcoming tour, there increased presence in pop culture and where Neil stands politically these days. Here are some key excerpts from the interview:This record examines a very different future than what you portrayed in Rush's 2112 album. Are they companion pieces in any way? Update: ‘Clockwork Angels’ Tops Amazon Bestseller List.Update: Clockwork Angels is now available for purchase in a lossless 96kHz/24-bit FLAC Audiophile download from HDTracks.com After five long years since their 2007 Snakes & Arrows album, Rush have finally returned with the release of Clockwork Angels; their 20th studio effort. The album has certainly been a 'work in progress'; one that began over two years ago when the band released the first two singles from the album - Caravan and BU2B. Following the lengthy Time Machine Tour of 2010-2011, Rush put the finishing touches on Clockwork Angels, producing a twelve-track album that critics have universally applauded thus far. Ahead of Clockwork Angels release tomorrow, MusicRadar has just posted an interview with the album's producer Nick Raskulinecz. In the interview, Nick touches upon each of the album's 12 tracks and his role as a producer: “Part of my responsibility as a producer – the biggest part of my job, really – is to be there for the artist and to help them see their vision through," says Nick Raskulinecz. 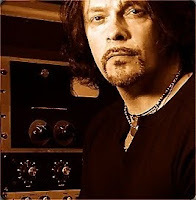 The Grammy-winning producer, who first worked with Rush on 2007's Snakes & Arrows, reconvened with the group in 2010 to begin sessions for Clockwork Angels, the sterling concept album masterpiece which will be released tomorrow, 12 June. "This album was Rush’s vision," says Raskulinecz. "It wasn’t mine. I was there to make sure it was played as brilliantly as they could play it, sung as high as Geddy Lee could sing it, and have the guitar solos bring me to tears. Tweet your questions for Geddy and Alex to #Livewithrush For more information and/or to post questions that Jeff might read to Geddy and Alex, click HERE. There will also be ten runner-up prizes given away which include Rush's new album, Clockwork Angels, and the DVD Live in Cleveland. Toronto (Oct.14/12 - Air Canada Centre) The contest runs June 1st through the 30th, 2012. One entry per person. Transportation to and from the concert is the winner’s responsibility. Thanks to reader Amanda Jane Bean for passing along the news. Decibel Magazine (America's Only Monthly Metal Magazine) has just posted the first of a two-part series titled Decibrity Playlist: “Best of” Rush". In it, a Rush playlist is selected by several hard rock and heavy metal artists. Also included is commentary on the influence of Rush from each of the artists. From the article: We may not write about these Canadians very often, but it’s undeniable that Rush has had a profound effect on legions of artists that we do cover. So to celebrate next week’s release of the ubiquitous band’s 19th (!) full-length studio album, we compiled a “best of” Rush playlist that features tracks hand-picked by some of the many musicians who have been slappin’ da bass over the years. Clockwork Angels Lyrics and Liner Notes and Album Artwork - oh my! With the release of Clockwork Angels almost upon us, you can now get a preview look at the album's complete lyrics, liner notes and artwork. The liner notes and lyrics are on the main Clockwork Angels Album Information Page while the artwork is available on the album's Image dB page. The liner notes include separate notes of thanks from Geddy, Alex and Neil; something they typically reserve for their tour book essays. Additionally, and fittingly, there is a tribute to their late photographer and friend, Andrew MacNaughtan. Some of the album's artwork was taken from a photo and, thus, is not of the highest quality. That will be remedied after the official release. The CD that is included with the July 2012 issue of Classic Rock Magazine includes a humorous 7-minute video interview with Geddy Lee. The interviewer asks Geddy a series of questions including: Have you ever used the phrase Do you know who I am? (Answer: Yes, with his wife in the morning...) Have you ever stolen anything from a hotel room? (Answer: Yes, a power converter) Have you ever been star-struck? (Answer: Yes, in meeting Pete Townshend at the Governor General's Awards Gala) What would save first if your house was on fire? Have you ever recorded a song you didn't like? (Tai Shan fans need not listen) You can view the entire video below or directly at YouTube. Thanks to Ed from RushIsABand for passing along the link. There is a new video interview with Geddy Lee that was conducted by Austria's Stormbringer.at. The interview, which took place in Cologne, Germany, clocks in at over 16 minutes long. In it, Geddy discusses the new album and the influence of the Steampunk theme on the concept story, his own past, the upcoming tour, and, perhaps most importantly, confirms that Rush have no intentions of retiring any time soon. You can watch the video below or via this LINK. Thanks to Eric from Power Windows for passing along the news. Last week, we were treated to 30-second audio samples from each of the tracks of Clockwork Angels from WalMart. Those samples were based on the first 30 seconds of each song. Now, the Italian website ibs.it has posted new 30-second clips of each track, coming from different sections of each song, all including some of Geddy's vocals. Update (06/11/2012): The one-hour special is now online at SoundCloud. Thanks Ed / RIAB! A one-hour long radio special titled Inside Rush: Clockwork Angels, created by FMQB Productions in association with Anthem Records, will air on radio stations across the nation during the week of the album's release (June 11th). The special will be hosted by Billy Corgan of The Smashing Pumpkins. Corgan is expected to have conversations with all three members of Rush about the new album, the music creation process, the upcoming tour and more. In addition to airing on radio stations, the special will also be available on SoundCloud. We'll have more details on the special as they become available. And for those of you who haven't pre-ordered Clockwork Angels yet, you can do so via this LINK. Pre-order today and help Rush's new album debut at #1!